Two leading carmakers are leading the charge to develop new electronics architectures. BMW and Audi, who often pioneer much that is new in automotive electronics globally, are in the process of developing radically new electronics architectures for future vehicles. The carmakers are taking a similar approach: high-performance central computing units replacing today’s outmoded distributed computing architecture. The auto industry is facing profound disruption, with new competitors from the IT and consumer electronics worlds making inroads. Google, Apple, Tencent, Uber, Alibaba, and Baidu are developing revolutionary new mobility solutions. Tesla is already here. Automated driving is coming faster than initially thought. The vehicle’s interior is quickly going digital. A revolutionary new architecture is needed that can take advantage of what has become the state of the art in consumer electronics: internet connectivity, cloud computing, swarm intelligence, and over-the-air feature updates. Today carmakers purchase infotainment systems and vehicle control systems from tier-one suppliers who tightly embed software components within electronic control units. If a carmaker wants to change suppliers, it must validate and test a completely different software stack—an enormously time-consuming and expensive endeavor. BMW and Audi are developing end-to-end architectures that connect wirelessly from the vehicle’s onboard electronics to the carmaker’s back end, and from there to HERE’s back end in the cloud, via the internet (see the Audi block diagram below). HERE, the digital map company jointly purchased by BMW, Audi and Mercedes-Benz, will use crowdsourced data to provide precision maps suitable for autonomous driving and location-based services. Flexibility: OEs can more easily switch suppliers and update vehicles with new features after sale. What’s most distinguishing about the new vehicle architecture is what Audi refers to as its central computing cluster and what BMW calls its central computing platform. Both consist of one or more general-purpose, high performance computers powered by extremely capable processors from suppliers such as Nvidia, Qualcomm (Snapdragon), or Mobileye. The car’s functions will increasingly depend on broadband data communications within the vehicle and with the cloud. At the top of BMW’s forthcoming hierarchical software architecture will be the central computing platforms for vehicle domains such as infotainment, autonomous driving, and body control, including a communications server that links the central platform with electronic control units, sensors, and actuators (see figure below). 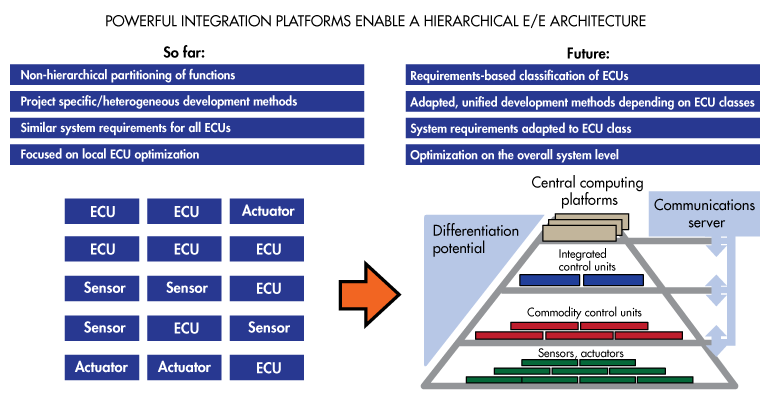 Next down in the hierarchy are the integrated electronics control units, standard ECUs similar to those used today for electronic stability control or engine control, in which OEM-specific functions are integrated. Further down the hierarchy are commodity control units, off-the-shelf parts with a range of standard functionalities (such as window lift or other body control functions). These standard ECUs will be free of any carmaker-specific functions or software code.